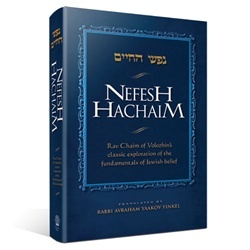 Rav Chaim of Volozhin's classic exploration of the fundamentals of Jewish belief. 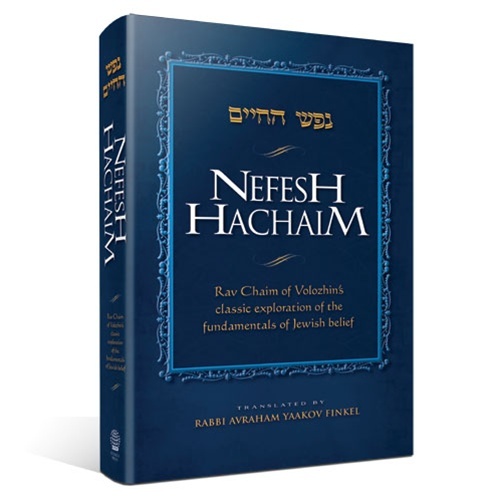 In Nefesh Hachaim, Rav Chaim of Volozhin -- foremost disciple of the Vilna Gaon -- shares his outlook on many fundamental Jewish beliefs. It is well-known that before the author’s passing, he urged his son to publish the Nefesh Hachaim before any of his other works, since he passionately wished to influence the people to achieve greater fear of G-d and intense love of Torah. The themes he deals with are many and varied. He discusses the profound impact that our mitzvos and prayers have on the universe; an understanding of berachos (blessings), the nature of the soul and of Olam Haba (the World to Come); whether one should combine Torah study with earning a livelihood, and whether man is greater than the angels, to name just a few. This classic work, now in English for the first time, will hopefully achieve the author’s heartfelt desire -- for all Jews to deepen their commitment to Torah study and their observance of mitzvos, so that we may ultimately merit to see the fulfillment of the verse, All your children will be students of Hashem, and your children’s peace will be abundant (Yeshayah 54:13). This beautiful new edition contains a thorough subject index and the complete Hebrew text of the sefer. Note: The Kabbalistic sections of the sefer have been left untranslated.